The Israel Conference™ May 31 & June 1, 2012 ~ Los Angeles, CA The Israel Conference™ is a fast-paced business conference showcasing the vitality and growth of Israel-facing business through a variety of panels on hot industry topics and trends with world-class speakers and high-quality networking. The Israel Conference™ brings together leading innovators and investors High Tech / Entertainment Media / Advertising / Mobile / Content / Gaming / e-Commerce / Energy / Clean Tech / Security / Medical Tech / Consumer Products that are coming out of Israel that are market-making and in demand. Check out their program and register. Co-Chairs Yossi Vardi, chairman of International Technologies and Sharona Justman, principal in Step Strategy Advisors, assemble top executives interested in investing in Israel-related businesses. Watch an excerpt from our coverage of the venture pitching in front of a critical, evaluation panel and the full audience. Organizer, Sharona Justman, endorses the quality of the sponsor hotel, the Luxe Sunset Hotel, and the services of its proprietor, Mr. Efrem Harkham. 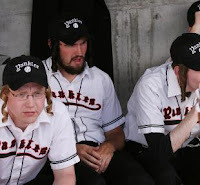 Wearing calf-high white socks for centuries off the field, a team of yeshiva bochurs try their skill on the diamond- that is, not gemology, but the baseball diamond. The Yankles is a movie about an Orthodox Jewish baseball team with a very unorthodox coach. Sibling filmmakers David R. Brooks and Zev Brooks co-wrote the script. Zev served as Producer, David helmed the direction of the film. The Yankles comedy is about a hapless Orthodox Yeshiva baseball team that earns a ticket to compete in the college world series. The team hires Charlie Jones, played by Brian Wimmer (Footloose, Flipper) to coach. Charlie is a washed-up, ex-major league center fielder on parole for multiple DUI convictions and desperate to fulfill his community service. While The Yankles strive for success on the field, Charlie works to rebuild his reputation and relationships. Don Most of "Happy Days" plays a former baseball champ at odds with his rabbinical student son (Michael Buster). The film, which has garnered numerous awards at domestic and international film festivals, is a hilarious and touching story about redemption. 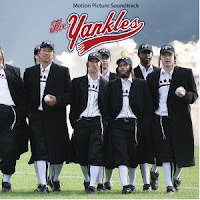 The Yankles runs in theaters for a week from, Friday, May 18th- Thurs May 24th in LA. (Adapted from interview article by Dana Gardner in I Am Rogue). 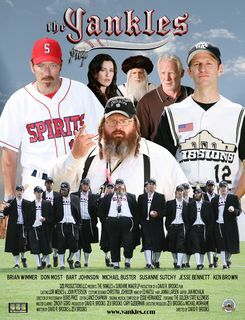 The Yankles' co-writers David and Zev Brooks describe The Yankels phenomenon from their booth at the Celebrate Israel Festival in Los Angeles for Israel Independence Day. "The Yankles." MPAA rating: PG-13 for language. Running time: 1 hour, 56 minutes. At Laemmle's Music Hall 3, Beverly Hills; Laemmle's Town Center 5, Encino through May 24th. It then moves to NYC at the Manhattan JCC on Tuesday May 29 from 7:30- 9:30. The L.A. Jewish Film Festival last night concluded its week of screenings throughout the city with Jewish themed, "Dorfman," starring Sara Rue and Elliot Gould. Actors and filmmakers spoke following several screenings during the festival, including Dr. Iddo Netanyahu, the brother of Israeli Prime Minister Benjamin Netanyahu and Entebbe rescue-hero, Yoni Netanyahu, who flew in from Israel for the premiere of "Cohen on the Bridge," following the shiva for his father Benzion, the patriarch of the Netanyahu family. Dr. Netanyahu appeared in and contributed his brother's letters to "Follow Me: the Yoni Netanyahu Story." He also assisted in the producing of the Entebbe-rescue, animated adventure, "Cohen on the Bridge," whose director, Andrew Wainrib, accompanies Dr. Netanyahu in this post-screening discussion, which Rob Eshman of the Jewish Journal moderates. As with other veterans of the pre-state Zionist movement, Benzion Netanyahu deserves the gratitude of the Jewish people for his labors. As the representative of Jabotinsky’s movement in the United States during World War Two, the Polish native who had moved to Palestine during his youth is credited with helping to persuade the Republican Party to adopt in 1944 an unprecedented pro-Zionist platform plank that caused the Democrats to follow suit. But he deserves just as much, if not more credit for his work as a scholar of Jewish history. And it is here, as much as in his embrace of Jabotinsky’s vision of a secure, liberal and democratic Jewish state in all of historic Palestine that his influence is felt. Pete Hammond, awards columnist and movie historian at Deadline Hollywood, moderated a panel of female co-stars at the West-Coast premiere of the biography of Bernie Schwartz: "Tony Curtis- Driven to Stardom." Panelists include Sally Kellerman, Mimi van Doren, Marian Collier ("Some Like it Hot" bassist), and Mr. Curtis' widow, Jill Curtis. David Suissa, of the L.A. Jewish Journal, moderated a post-screening discussion with "The Price of Kings" series "Shimon Peres" and "Yasser Arafat" installments director Richard Symons; and Andrew Wainrib, producer of Israeli rescue at Entebbe animated drama, "Cohen on the Bridge." The L.A. Jewish Film Festival premiered a week of screenings with "Tony Curtis: Driven to Stardom." A panel discussion, moderated by Hollywood columnist and historian, Pete Hammond, brought out anecdotes from family and actors who co-starred in Tony Curtis / Bernie Schwartz pictures, including Mimi van Doren and Sally Kellerman. Several movie colleagues and friends, such as Stella Stevens, also attended, through the coordination of motion picture and television research archivist, Marvin Paige. Bio-pic "Tony Curtis- Driven to Stardom"
L.A. Jewish Film Festival moderator, Pete Hammond, discusses 'Tony Curtis: Driven to Stardom" and the history of Jewish people in Hollywood. Tony Curtis' co-star Sally Kellerman speaks on the panel of Tony's co-stars- sharing raw stories of working with him- onstage at US premiere of "Driven to Stardom." Jill Curtis was married to Tony during the latter part of his life. She shares personal details of Tony's Jewish identity during his longest marriage. Jon Voight, ("National Treasure") discusses Hollywood's founding by Jewish immigrants and his respect for Jewish contributions to American entertainment culture.